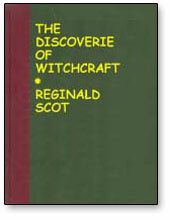 Reginald Scot published The Discoverie of Witchcraft in 1584. Scot believed that the prosecution of those accused of witchcraft was irrational, so his aim was to show that witches did not exist, by exposing how feats of magic were performed. You won't be adding any of the tricks in this book to your repertoire, but the book makes for a great read for anyone interested in the very early days of the publication of magic tricks. Even though the book was written over five-hundred years ago, it gives an interesting glimpse into the history of the magic that we performed today. This particular version is Kaufman and Co's authentic reproduction of the classic text. In addition to the complete original text, this volume also includes an insightful introduction by Montage Summers detailing the historical importance of this groundbreaking text.